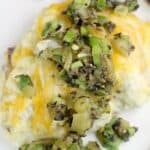 Creamy mashed potatoes loaded with cheese, garlic, and Hatch green chile, then TOPPED with olive, onion, and more Hatch green chile for an awesome tapenade-ish kinda vibe. Put the potatoes and garlic in a pot and add enough water to cover. Boil ~15 minutes or until potatoes are fork tender. Drain. In a bowl, add the cooked potatoes with the garlic, milk, butter, ranch, salt, and pepper. Mash the potatoes until mostly creamy but still a little chunky. Add 1/4 cup parmesan and 1/2 cup cheddar cheese, and stir to combine. Taste for seasoning. Transfer the mashed potatoes to a bake dish or small casserole dish. Top with remaining cheese. Bake at 350F for 10-15 minutes or until warmed through and cheeses are all melty. In a small bowl, combine the ingredients for the Hatch green chile-olive topping. Serve over the mashed potatoes. Yields 6 servings. Since I was cooking for adults and kids, I got mild chiles. But by all means, go big or go home and get the hot ones if that's ur thing.